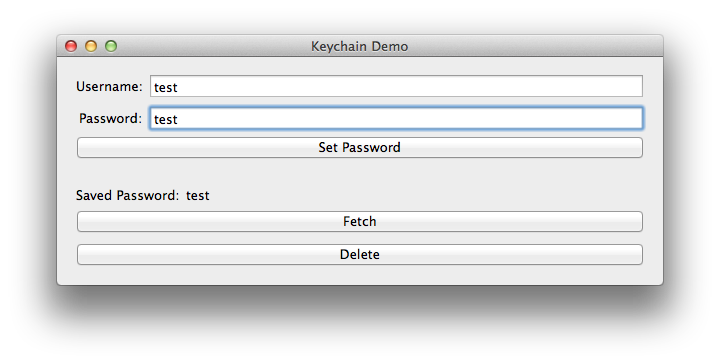 The keychain is a great feature in OS X, allowing you to store passwords securely. In this tutorial I’ll outline how to store passwords in the keychain so your apps don’t have to worry about securely storing the passwords themselves. Before I start, you can skip straight to the code on github here. The MonoMac binding of the OS X keychain is somewhat basic at this moment in time, however it should be enough for basic password storage. 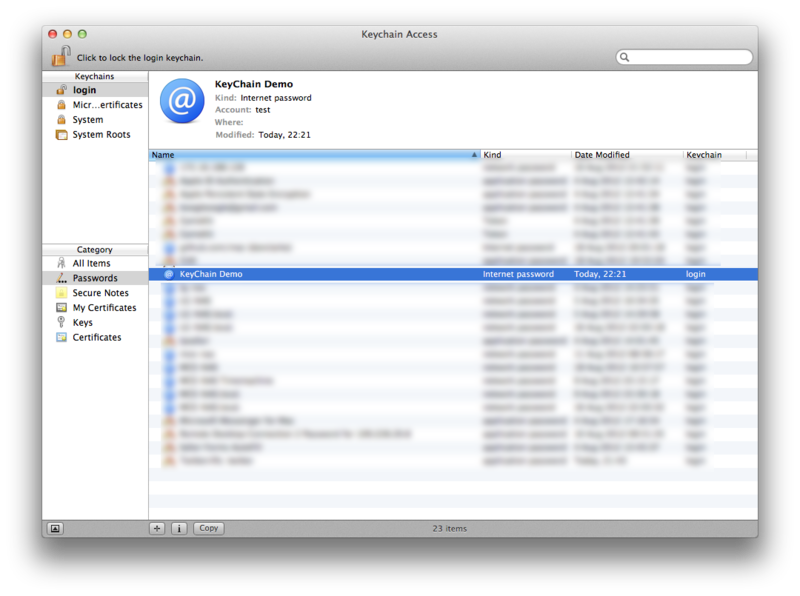 OS X supports multiple keychains, as well as multiple types of passwords. At the moment the MonoMac bindings limit you to the system (well, user’s login) keychain, and only the ‘Internet Password’ keychain type. Additionally you’ll want to sign your app to ensure your passwords are uniquely identified, without signing I’ve noticed that other MonoMac apps authored by myself seem to conflict with each other. We store keychain records in a class of SecRecord, while the SecKeyChain static class handles the interaction with the keychain itself. When searching for records, you’ll fill in a SecRecord with the fields you need to match, then get SecKeyChain to return a matching record. You need to be careful not to try and insert duplicate records, if you do it’ll be difficult to pull out the record you want – it’s undefined which one you’ll get. This can lead to odd bugs where one second you get the correct password, and the next you get the wrong one. The password for Internet Passwords is stored in the ValueData property, this is of NSData type rather than the string you’re probably expecting. This code will return a matching record, or NULL if none are found. If more than one record matches your search criteria, you’ll get a random record. For this reason make sure you never accidentally insert duplicate records, or you’ll get unpredictable behaviour in your app. Remember, the search record you specify will be used as the search criteria – the filled in fields will be used for the search. Remember, the ValueData property is NSData, not a string. If MonoMac allows you to use a record type of ‘Generic Password’, the password will be stored in the Generic property rather than ValueData. Generic is also an NSData type. For code on how to perform a check and then update / insert as necessary, check the sample code. The first parameter is handled in exactly the same was as when querying for an existing record, the second parameter is your newly updated record. This guide has demonstrated how to interact with the OS X keychain using MonoMac. Make sure to check out the sample project for a simple utility class that wraps up all of the necessary functionality with a friendly interface. System.Reflection.TargetInvocationException: Exception has been thrown by the target of an invocation. —> System.IO.FileNotFoundException: Could not load file or assembly ‘MonoMac, Version=0.0.0.0, Culture=neutral, PublicKeyToken=null’ or one of its dependencies. Dan, thanks. Liked your blog. I tried to store and retrieve encryption keys with SecKeyChain, but couldn’t figure it out. At the moment, what I could do is to store keys (XML strings) as generic passwords. Any thoughts?